Mikkel Metal aka Mikkel Meldgaard is back on Echocord with a new powerfull Ep. 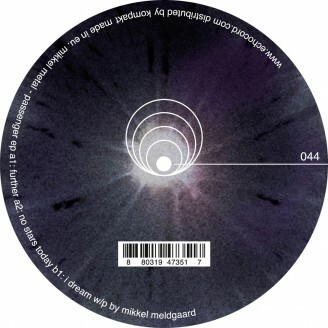 After the latest succesfull full length album with Tikiman here comes the next Ep On "Passenger EP" Mikkel Metal tries explores new facets of his sound and take a detour from the dub-technom, thats his usual trademark. While obviously still retaining a "Metal"-signature, there's an opening towards a more raw dirty detroit sound here, that's clearly new to his production. Opening track "further" is slow tough track with a heavy kickdrum and simple theme. In it's austerity it might actually remind one of very early Metal productions like "eight" form echocord 01. Remaing tracks "no starts today" and "I dream" both build on a dirty simple groove and layers synths and distorted themes on top.